The Kentucky Farm Bureau State Young Farmer Summer Outing will be held July 14-16, 2016, in Owensboro, Kentucky. This event will provide a relaxed, fun atmosphere for young farm families to socialize, tour local ag-related sites, and gain a better understanding of the Farm Bureau organization. The weekend will formally begin with the preliminary rounds of the 2016 Discussion Meet Contest Friday morning. Applications were mailed to the counties in March and are due to the state office no later than Friday, June 17. Following the Friday Opening Luncheon, participants will have an exciting day at Holiday World & Splashin Safari which is a combination theme park and water park, located in Santa Claus, Indiana. Families will enjoy a fun afternoon and an evening to remember at Holiday World with great food, games, fireworks and full access to the park. 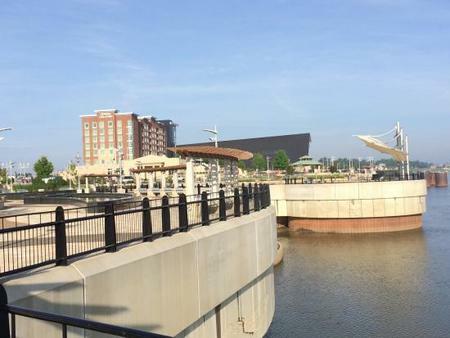 For those wishing to leave early, Owensboro hosts “Friday After 5”, which is a summer-long series of free outdoor concerts held every Friday on the river front. The festival includes live bands, family events, food and entertainment and their “Toast to the Sunset.” Everything is located within walking distance of the hotel. Saturday begins with the “Eggs and Issues” Breakfast featuring our annual policy development session. Following breakfast, participants will be asked to choose between five available tour options. The Young Farmer Summer Outing will conclude Saturday evening with a dinner catered by Moonlight Bar-B-Q. Young farmers will enjoy good food while being entertained by the sound of Kentucky Bluegrass music. Families will also enjoy the adjoining Smothers Park playground which is a one of a kind master piece. The state of the art playground is extra special and kids will think they’re in paradise. Additionally, outing participants will have an opportunity to purchase “Mary Poppins” musical tickets at a reduced price as they register for the Summer Outing. Families will enjoy the plush atmosphere of the RiverPark Center’s Cannon Hall stage as Back Alley Musicals Present “Mary Poppins”- everyone’s favorite nanny. The show will begin at 7:30 PM. Hotel reservations should be made directly with the Hampton Inn & Suites Downtown Owensboro/Waterfront by calling (270) 685-2005. In order to receive the special room rate of $115 (plus tax), please indicate that you will be attending the Kentucky Farm Bureau Young Farmer Summer Outing, July 14-16. Reservations requested after the Friday, June 17 early registration deadline are subject to availability and cannot be guaranteed for the negotiated room rate. Beginning Friday, May 6, you can register online. Early conference registration will be available through Friday, June 17, with a fee of $135 for adults and $75 for children ages 2-12. Beginning June 18, registration will increase to $160/adult and $90/children. There will be an option to pay by credit card or by check. If you choose to make payment with a check, the State Office must receive the payment check within 7 days after the registration is submitted online. If the State Office does not receive payment within 7 days after the registration is submitted online, the registration will be cancelled within our system. Modifications to your 2016 Young Farmer Summer Outing registration requests can be made via the online system until Friday, July 1, 2016, at 11:59 p.m. EDT. Should you cancel your 2016 Young Farmer Summer Outing arrangements or circumstances arise that prevent you from attending your registration and extra event costs are all final and non-refundable after Friday, July 1, 2016, at 11:59 PM EDT. If the 2016 Young Farmer Summer Outing is officially cancelled, a refund is possible minus any penalties or non-refundable expenses that apply. We hope you will make plans to attend this year’s conference. It should be an outstanding event and fun for the whole family. If you have any questions or need additional information, please feel free to contact Scott Christmas at (502) 495-5000, x. 7221 or via e-mail at Scott.Christmas@kyfb.com or Jackson Tolle, at (502) 495-5000, x. 7374 or via e-mail at Jackson.Tolle@kyfb.com.